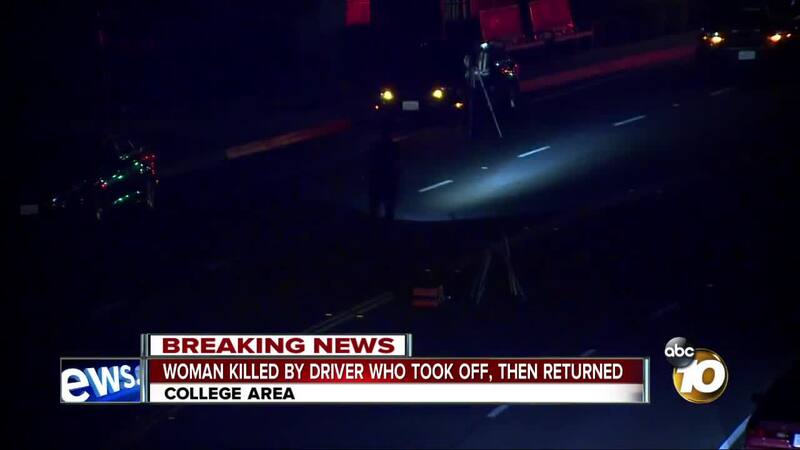 SAN DIEGO (KGTV) - A woman visiting San Diego to spend time with her daughter is dead after being struck by a car near San Diego State University Friday evening. San Diego Police Department says the woman was hit at the 4800 block of College Avenue just south of Montezuma Road in the College Area at approximately 7:45 p.m. The 48-year-old female victim was transported to an area hospital where she died. Police say the victim was not using a crosswalk when she was struck in the number two northbound lane of College Ave. The driver fled the scene according to SDPD but returned about an hour later. The driver is a 40-year-old female and detectives say they are still determining if this will continue to be classified as a hit-and-run. Police expect the intersection to be shut down for several hours.